The essence of this exploit is in a voluntary acceptance of humiliation and insults in order to achieve the height of humility, meekness and goodness of heart and by this to cultivate love even for one's enemies and persecutors. It is a life-and-death struggle not only with sin, but with the root of sin - pride in all its secret displays. A fool-for-Christ (yurodivy) is determined to follow the crucified Christ and to live keeping completely away from all earthly comforts. But at the same time he is aware that such behaviour threatens to create for him the reputation of a saint among the people and to strengthen his self-love and increase his pride as being one of God's elect - which is one of the most dangerous rocks in one's struggle for sanctity. So as not to be taken for a saint, a fool-for-Christ rejects the outer aspect of dignity and composure of mind that inspires respect and prefers to appear a miserable, weak creature, deserving mockery and even violence. Deprivations to which they subject themselves, their heroic, almost superhuman ascetic podvigs - all this must seem to be devoid of any value and to evoke nothing but contempt. In other words it is a complete denial of human dignity and even any spiritual value of one's own being - humility raised to a heroic degree and at times, as it may seem on the surface, falling into the extreme. But in the heart of a fool-for-Christ lives the memory of the Cross and the One Crucified, the slaps on His face, the spitting and the flagellation, which encourages them at any moment to endure any reviling and oppression for Christ's sake. The first and the third aspects of foolishness-for-Christ are podvig, service, and toil; they have spiritual and practical implications. The second aspect provides the direct expression of religious needs. There is a living contradiction between the first and the third aspects. Ascetic oppression of one's own pride is achieved at the cost of exposing other people to temptation and the sin of condemnation, or even cruelty. Saint Andrew of Tsaregrad besought God to forgive those whom he had provoked to persecute him. Any act for the salvation of people evokes gratitude, respect, and thus eliminates the ascetic purport of foolishness-for-Christ. That is why the life of a fool-for-Christ is a constant swinging between acts of moral salvation of people and acts of immoral scoffing at them. In Russia, foolishness-for-Christ was dominated in the beginning by the first, or ascetic side; but by the 16th century it was undoubtedly the third aspect - social service - that was dominant. It is customary to believe that the podvig of foolishness-for-Christ is exclusively a calling of the Russian Church. This opinion, however, contains an exaggeration of the truth. The Greek Church venerates six fools-for-Christ. The Lives of two of them- St. Simeon (VI cent.) and St. Andrew (IX cent.) were very extensive and interesting and were known in Ancient Russia. Our ancestors especially loved the Life of St. Andrew for the eschatological revelations that it contained. And the beloved Feast of the Protection of the Mother of God made the "Saint from Tsaregrad" close to all those in Holy Russia. Indeed, it was namely St. Andrew who, during Divine Liturgy in Constantinople, had a vision of the Mother of God, covering the world with her mantle - in honor of which the Feast of the Protection of the Mother of God is celebrated on October 1st. This first example was followed by others. 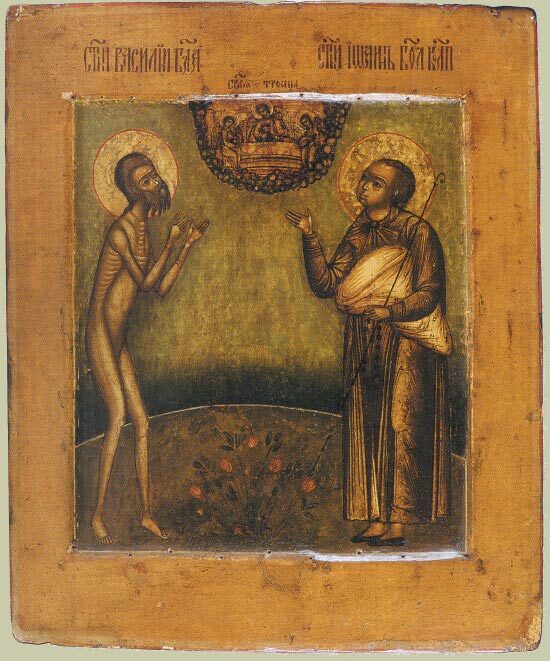 Though during a long period the breeding grounds of this new type of saints most probably remained the northern Russian areas, which were in direct contact with the west and particularly half-European, commercial Novgorod. It is not possible to innumerate here all the fools-for-Christ, honoured by the Russian people, both canonized and uncanonized. The number of those officially canonized as saints by the Church is comparatively small: 36. The number of uncanonized fools-for-Christ is quite large. A type of fool-for-Christ was also reflected in Russian literature. Pushkin in "Boris Godunov" depicted the blessed Ivan Big Cap, who had lived in Moscow during the rule of Tsar Fyodor Ioanovich, Ivan the Terrible's son. People said about him that he liked " to look at the sun and meditate on the Sun of Truth". Children would mock him, but he never punished them, but would instead smile and foretell their future. Another fool-for-Christ called Grisha is described in Leo Tolstoy's book "Childhood. Boyhood. Youth". The pages describing the wanderer's night prayers are fascinating and are not inferior to the pages devoted to Starets Zosima in Dostoyevsky's book " The Brothers Karamazov". After all that has been told above, it is probably possible to conclude, that the fool-for-Christ is a type of saint that conveys better than any other the spiritual features peculiar to Russian people. Love for Christ and His Cross, love even unto death, and a willingness to imitate Him, are alive in the heart of every Russian, consciously professing Christianity. In fools-for-Christ this love is taken to an extreme. The means to achieve it are through denial of this world and its wealth, exercised with the help of grace at a supernatural level. Spiritual wandering and freedom amounting to anarchical individualism develop to full extent in the life of a fool-for-Christ. Contempt for any kind of form or reasonable limits, thirst for the absolute in everything, abhorrence for any generally adopted rules, narrow-mindedness in any form - all these things are fully expressed in foolishness-for-Christ. All these things are flouted and mocked at by fools-for-Christ for the sake of Christ and His Truth. Believing in transformation in the life to come, the fool-for-Christ is sanctified by the Cross and infinite sufferings It brings. This is the synthesis of the innermost aspirations of a Russian and the final clue to the almost superhuman podvig of yurodstvo - foolishness for Christ's sake.